Of the seven continents, Australia is the flattest, smallest, and, except for Antarctica, the most arid (dry). Including the southeastern island of Tasmania, the island continent encompasses 2,967,877 square miles (7,686,810 square kilometers). Geographically isolated from other landmasses for millions of years, Australia boasts unique animal species, notably the kangaroo, the koala bear, the platypus, and the flightless emu bird. Outside of a few regions (including lush Tasmania), the continent is dry, bleak, and inhospitable. estimate that Australia is presently drifting northward at a rate of approximately 18 inches (28 centimeters) per year. Millions of years of erosion have worn down the continent's surface features, giving it a relatively flat, uniform appearance. Because of this monotonous desert and semi-desert flatness, broken only by salt lakes, much of Australia is referred to as outback. A few lush areas exist on the continent. The northern section of the continent experiences tropical temperatures. Cape York Peninsula, jutting up from the northeast section of the continent, is largely covered by rain forest. And an exception to the uniform flatness of the continent is the Great Dividing Range, an entire expanse of mountain ranges stretching along Australia's east coast. The Great Dividing Range, which extends 1,200 miles (1,931 kilometers), was created during a 125-million-year period beginning 400 million years ago. The Australian Alps form the southern end of the range and contain Australia's highest peak, Mount Kosciusko, at 7316 feet (2,230 meters). The Great Dividing Range is coursed by rivers and streams. Because the range tends to trap moisture from easterly weather fronts originating in the Pacific Ocean, the landscape west of the range is forbidding and the weather hot and dry. Starkly beautiful mountain ranges—the McDonnell and the Musgrave—punctuate the middle of the Australian continent. 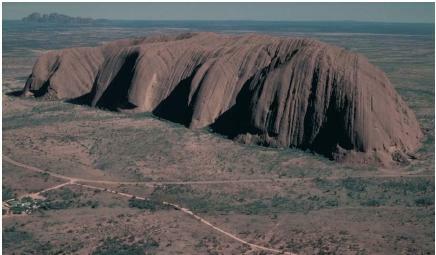 Between these ranges lies the world's largest sandstone monolith, Uluru (commonly known as Ayers Rock). Uluru is the most sacred site in the country for Australia's aborigines, the native people of the continent. The monolith, two-thirds of which is believed to be below ground surface, is about 2.2 miles (3.5 kilometers) long and 1,143 feet (349 meters) high. The center of the continent also features the Henbury Craters, one of the largest clusters of meteorite craters in the world. The largest of these depressions, formed by the impact of an extraterrestrial rock, is about 591 feet (177 meters) long and 49 feet (15 meters) deep. The world's largest coral formation, the Great Barrier Reef, stretches for about 1,250 miles (2,00 kilometers) along Australia's northeast coast. Several individual reefs compose the Great Barrier Reef, which is home to unusual marine life. In some places, the reef is more than 400 feet (122 meters) thick. It is separated from the Australian continent by a shallow lagoon 10 to 100 miles (16 to 161 kilometers) wide. Tasmania separated from mainland Australia only 10,000 years ago, when sea levels rose after the thawing of the last ice age. The island lies 150 miles (240 kilometers) due south of the southeastern tip of Australia, separated by the Bass Strait. Geologically, the island is similar to the Australian continent. However, rainfall is moderate, and the mountains on the island are covered with dense forests. trapped underground throughout the continent. Australia supplies much of its oil consumption needs domestically, producing about 25 million barrels per year. 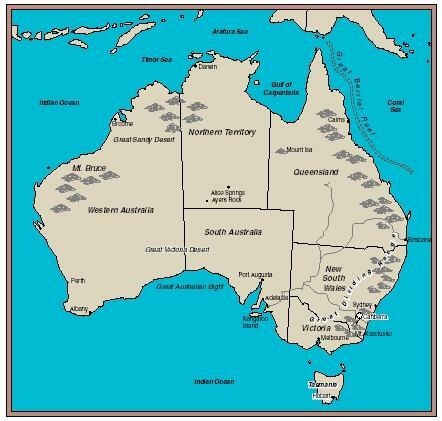 Australia has rich deposits of uranium ore, iron ore, nickel, lead, and zinc. In the case of uranium and iron ore, Australia has billions of tons of reserves. Uranium ore is refined for use as fuel for the nuclear power industry. Gold production in Australia peaked early in the twentieth century, but is still quite substantial. The continent is also well known for its precious stones, particularly white and black opals from the south-central region of Australia. I love this website and all of the other ones by this same autor. We have a project due every week and we need information on topography which is what he is asking for the most. I love this website and keep on making more!!!!! i like this web page... my friend Karry showed it to me and now i am going to spread the word to all of my friends about this great web page. You should make a search engine for like all about topography in different countries and stuff. like seriously dude you should! !